Founder and driving force of the Arts Acre Foundation is Shuvaprasanna. His special relationship with Germany began in 1986, when renowned author Günter Grass and his wife spent 6 months in Kolkata*). Grass, sculptor, graphic artist and painter himself, and the energetic, well connected Indian fine artist became friends. Shuvaprasanna introduced the German couple to Rabindranath Tagore's home place Santiniketan and took them around to other sites. Günter Grass presented some of his drawings in a show during the inauguration of the Arts Acre village in the north of Kolkata. That was in January 1987. This village was a modest early version of todays large Arts Acre Campus opened 2014 in New Town, Kolkata. 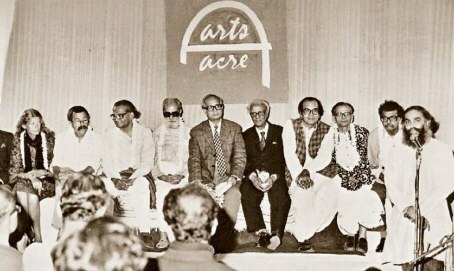 Inauguration of Arts Acre village in January 1987 with Ute and Günter Grass (left), Shuvaprasanna speaking (right). Mutual visits, exhibitions and additional relationships with artists and art lovers in Germany, as in Dresden, Augsburg, Munich and other places, followed. When Shuvaprasanna exhibited in Munich 1988, Günter Grass came to open the event. And it was there, that he met Christian Ude, later Lord Mayor of Munich, the first time. In the early 90'ies an initial exchange project brought artists from the Obergrabenpresse group of Dresden to the Arts Acre village in Kolkata, and Shuvaprasanna visited Dresden subsequently on invitation of the German government. The resulting exhibition "Dresden - Calcutta" of printed graphics and poems found its home at the new Arts Acre Museum. Dr. Martin Ney (right), Ambassador of the Federal Republic of Germany to the Republic of India, accompanied by German Consul General Olaf Iversen (left), inaugurated the new Gallery "Dresden - Calcutta", May 2016. *) Günter Grass: Zunge zeigen, Luchterhand Verlag, 1988, a diary with drawings, was written and drafted during that time from August 1986 to January 1987.